For Mario Strikers Charged, Next Level Games managed to take the grittiest Mario game and take it... to the next level. Art\movies\stadiumtest.thp is a a test rotation of a stadium. 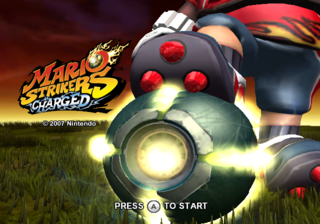 Much like Super Mario Strikers, Charged uses .INI files to control parameters of the game. And once again, there are some interesting extra files thrown in. The file datetime.ini contains a nice little time stamp message of when the disc image was compiled. Hewan Woolley is credited for Programming. Another file, datetime.ini.real, has a similar message. It was made a week later. Chad York is credited for Music Composition. The files that control the stats of the characters were given a completely new format. Despite not being used in the game, the Super Team has their own file. Other than being a bit taller, their stats are the same as Mario's. At the top of every character file, before the height/weight section, is a comment referring to programmer Bryce Holliday. There is also an example character file, aptly named example.ini. It lacks a line for Hitting Distance, and has an extra section for Power-ups, which none of the characters use. The files for controlling the difficulty level were given better organization than in Strikers, shedding some light on their usage. In fact, they specifically point out which files were for testing purposes. The file DifficultySuperhuman.ini returns, now with 100% more explanation. The file DifficultyBaseline.ini has a value of 0.5 for every stat. A number of the files in the game are carried over from the first Strikers, including GameTweaks.ini and its odd commentary. This also means references to random Bowser attacks, which were removed from the game due to Bowser being a playable character. This file was likely used for online profile registration. The names do not seem to correspond to any staff members. A file with very simple contents. It was probably used to toggle a stress testing system to check for memory leaks or other such issues. that isn't read by the game. This file must be at least 32 bytes long. The loading screen before a match is different between the NTSC and PAL versions. The NTSC version shows the mugshot for the captain while the PAL version shows only the captain's head. This page was last modified on 29 January 2018, at 14:24.